Alibaba executive chairman Jack Ma lacks the media-trained sheen of many US CEOs and that absence is welcome. Playful, self-deprecating, humorous, fond of the west but not to the point of having “gone native”, he reminds me at times of that other big merchant of panoramic vision, Softbank CEO Masayoshi Son. In an interview today at the World Economic Forum in Davos, Ma opened up to the CBS News anchor Charlie Rose on his life so far and his ambitions for the e-commerce phenomenon he started and runs. The highlights of this discussion, edited for sense, flow and brevity, are below. Ma calls himself “100 per cent made in China”. He learned the English language and western views of the world acting as a free guide for tourists. Ma used the web for the first time on a 1995 visit to the US in a Seattle bank and says that if you had searched for China online in 1995 no data would be returned. He quips that his first search term was “beer” on a Mosaic browser over a slow link although at first he was frightened of using the computer in case he broke it and could not afford to pay. He and a friend designed a “shocking” website focused on China. He uses “Jack Ma” because he had been told by a western lady tourist that his real name, Ma Yiu is difficult to pronounce. The lady’s husband and father were called Jack. “I said to a waitress, do you know about Alibaba and she said ‘open sesame’. I asked about 10 people and they said ‘open sesame’ or ‘40 thieves’. Also it starts with ‘A’ so Alibaba is always top. “For the first five years, I just wanted to survive. For the first three years we made zero revenue. I remember many times when I go to the restaurant to have dinner and when I was trying to pay the bill the manager of the restaurant would say “your bill is paid and [present] a small note [from another diner] saying ‘Hey I’m your customer. I made a lot of money and I know you don’t make any money.’"
Ma says he never received money from either government or banks. When he could have used it, they did not offer any and now he doesn’t need their money. Alibaba has over 300 million customers and 100 million buyers visiting the site every day. The company is creating 14 million jobs directly and indirectly for China. Headcount has grown from “18 people in my apartment to 30,000 people in four big campuses”. Average age of staff is 27-28. Today Alibaba has 10 million customers outside China. 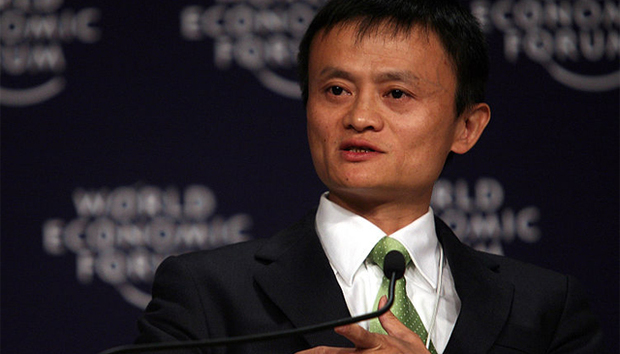 His goal is two billion customers globally, making Alibaba the “electronic world trade organisation”. “We’re still a baby,” Ma says, predicting that in the next 15 years e-commerce will be treated as a utility, “like electricity”. Ma says Alibaba is second only to WalMart in transaction volumes but he expects transaction volumes to pass those of WalMart in 10 years, having made a bet with a visiting manager form the US retail giant. “One of the secrets of our success is we have so many women,” Ma says. Today, 47% of staff are women, 33% of managers are women and 24% of senior managers. “Women in this world, in the 21st century, you have to make sure to empower others. Women think about others more than themselves. [They think about] kids, husband and parents more than the men." “I like the Hollywood innovation. I learned so much [from] the movies especially Forrest Gump. Simple. Never gives up. People think he’s dumb but he knows what he’s doing. This is the guy we should learn from. Believe what you’re doing. Love it, whether people like it or not. Life is like a box of chocolates, you never know what you’ll get. It’s not a good feeling being rejected by so many people but later we find that the world has a lot of opportunity. Hollywood gave me inspiration. A movie is the best product that can help Chinese people understand. In the [American] movies all the heroes look bad but in the end they succeed. If it was in China, everyone dies! Ma has a tai chi trainer.